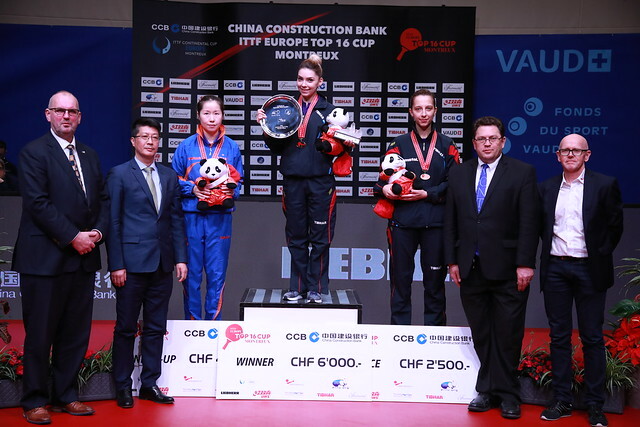 Spectators in Montreux, Switzerland enjoyed a fantastic opening day of action at the China Construction Bank 2018 ITTF-Europe Top 16 Cup and there is more exciting action coming their way on Sunday 4th February with trophies and World Cup qualification on offer. After a strong opening to the tournament, Vladimir Samsonov is now just two wins away from securing the Men’s Singles gold medal for the sixth occasion. However, a tough challenge awaits the Belarusian with second seed Timo Boll, who is also in search of a sixth title at the event, providing the opposition in the last four. All of Samsonov and Boll’s titles were won under the Europe Top 12 format but since the formation of the Europe Top 16 in 2015 there has only been one male champion and that is Dimitrij Ovtcharov. Earning his first trophy at the 2012 event, Ovtcharov also prevailed in 2015, 2016 and 2017 and is now hoping to remain at the summit for the fourth consecutive year but his opponent in the semi-finals will be keen to prevent that from happening. Denmark’s Jonathan Groth was in inspirational form on day one in Montreux, can he spring a major shock when he meets World no.1 Dimitrij Ovtcharov on day two? Elizabeta Samara’s best result at the Europe Top 16 was a fourth position finish achieved two years ago in Gondomar and now the Romanian star has a chance to surpass that personal best record. In the last four she will face Li Jie of the Netherlands in a repeat of the 2015 European Championships Women’s Singles final. Samara prevailed on that occasion, but Li Jie is the current holder of the Europe Top 16 Cup and will be determined to keep the title in her possession come the conclusion of the tournament. The other semi-finals fixture sees two players in uncharted waters as Romania’s Bernadette Szocs and Sweden’s Matilda Ekholm compete in the penultimate round of the event for the first time. Last year when the Europe Top 16 was held in Antibes Szocs and Ekholm finished in sixth and seventh positions respectively, now one of the two players is on the verge of reaching the final. Following the conclusion of the semi-finals matches, there will be play-off fixtures to decide which competitors will finish in third and fourth positions before the two finals bring the event to a close. Players who finish in the top three positions in the Men’s Singles and Women’s Singles categories will reserve their invitations for the Liebherr 2018 ITTF Men’s World Cup and the 2018 ITTF Women’s World Cup respectively. Play on day two gets underway from 10.00am (local time).